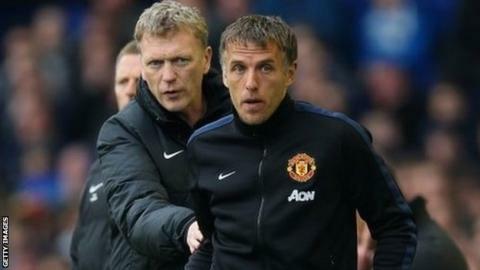 Manchester United coach Phil Neville admits he expected to be celebrating another Premier League title success at Old Trafford this season. Instead, the six-time winner says the final home match was a career low. "Walking around the pitch after the game against Hull City was probably the emptiest I've ever felt on a football field," said Neville, 37. "For a club that should be challenging for league titles, to finish sixth or seventh is obviously not good enough." The former United defender returned to the club last summer as a coach. He was appointed by David Moyes, who replaced Sir Alex Ferguson as manager last summer, and stayed on to work alongside interim boss and former team-mate Ryan Giggs following the dismissal of Moyes in April. Neville said the departure of Moyes, previously his manager at Everton, gave him one of his toughest days in the game. "I took the job at United fully expecting to be walking around after the last home game of the season either challenging for a league title or parading a league title, because that's what this club demands," he said. "We've got to make sure next season we are doing that." He added: "It's been a real difficult season. "To see a man who, for the last nine years, has put so much faith in me, giving me a platform either to play or to coach, lose his job was probably one of the toughest days that I've had in football." Former England international Neville admitted he was unsure of his future beyond the end of this season, with United widely expected to appoint Dutch national manager Louis van Gaal as their new boss next week.